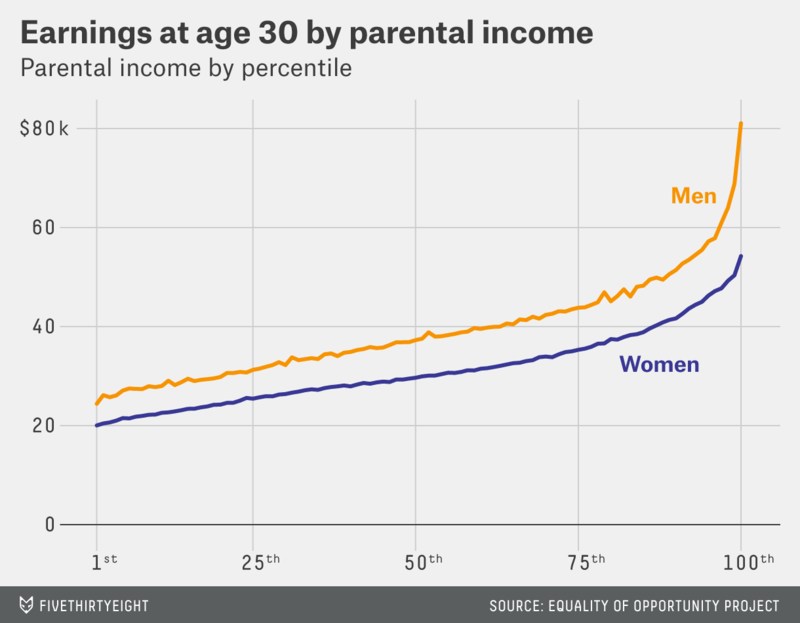 But perhaps even more striking is the strength of the relationship between parental and adult income for both sexes. Children from poor families are much less likely to work in adulthood than children from middle-class families. Only about 60 percent of children from the poorest families are working at age 30, compared with 80 percent of children from median-income families.2 And the relationship extends beyond the very poor; the higher a person’s parents were on the earnings ladder, the more likely he or she is to work as an adult — at least until the very top, when employment rates dip again. It isn’t immediately obvious what explains the drop-off in employment among the children of high earners. At the extreme top, the richest 1 percent, it makes sense — many of these families earned $1 million or more per year, so their children might not need to work. But the drop-off begins around the 93rd or 94th percentile, where families, while affluent, probably don’t make enough to give their children a life of leisure. These children of the well-to-do might not be working because they’re attending graduate school, or because they work as entrepreneurs; but these explanations aren’t supported by the data, Chetty said in an email. Another possibility: The paper’s measure of parental earnings doesn’t include investment income, so some of those families might be much richer than their earnings suggest. But while growing up rich is a big advantage, it doesn’t guarantee you’ll be rich in adulthood (or at least young adulthood). 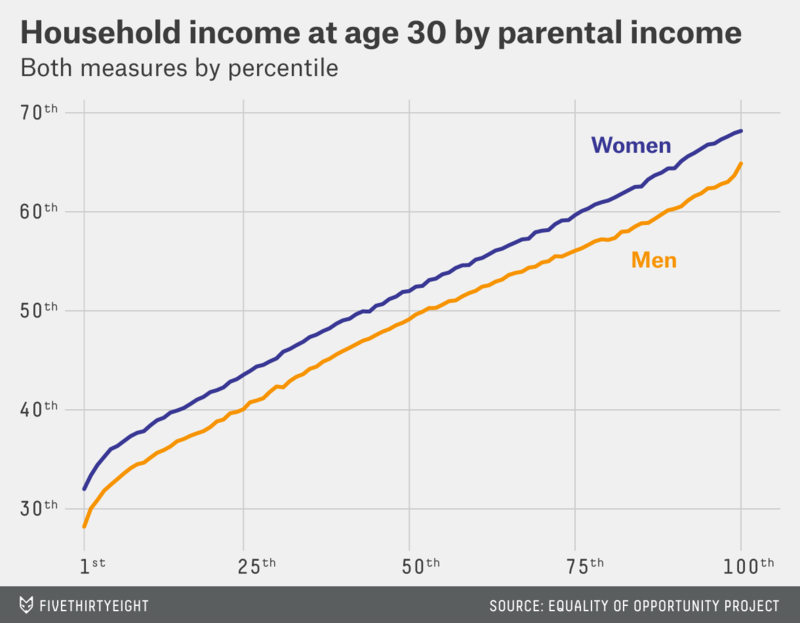 The chart below shows household income at age 30 based on household income in childhood, using percentile ranks instead of dollar figures. Children from the richest 1 percent of families end up being, on average, in about the top third of households at age 30 (the 68th percentile for women and the 65th percentile for men). Similarly, children from the poorest 1 percent of families end up in the bottom third at age 30. Both groups, in other words, move toward the middle — but not all the way. The new research is the latest in a series of papers that Chetty and various collaborators have written using a detailed data set from the IRS. Unlike most income data, the IRS figures aren’t based on a survey or a representative sample; rather, they include essentially everyone in the U.S. between 1996 and 2012. In this and other recent work, the researchers focus on children born from 1980 through 1982 who were U.S. citizens in 2013, or approximately 10 million people. 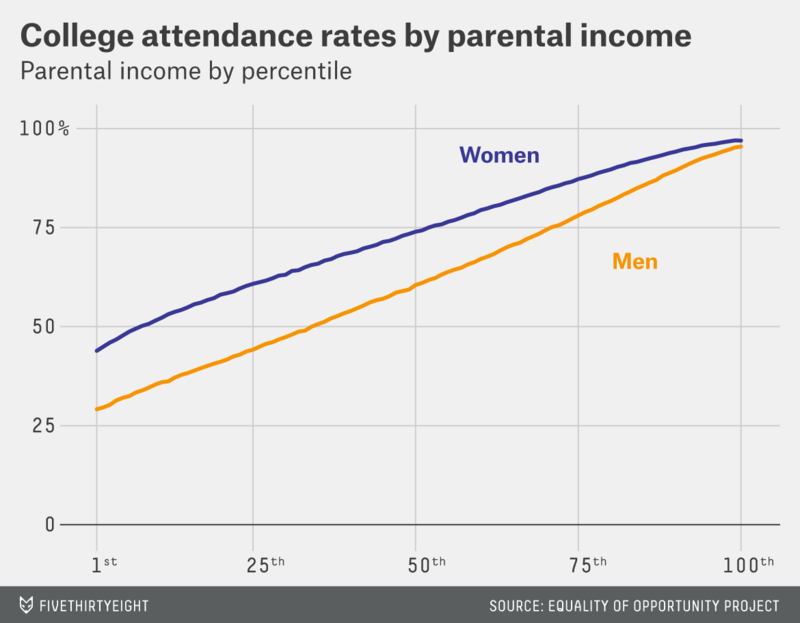 They look at how much their parents earned in 1996 to 2000 (roughly the children’s high school years) and how much the children themselves earned at age 30. Chetty also looks at a more complicated factor: family structure. Children who grow up in households with married parents earn more in adulthood than the children of unmarried parents.4 But the trends look very different for boys than for girls. For boys, growing up in a household with married parents has a strong connection with employment and earnings in adulthood. Chetty doesn’t try to address whether family structure causes these different outcomes, or whether both are caused by another factor. 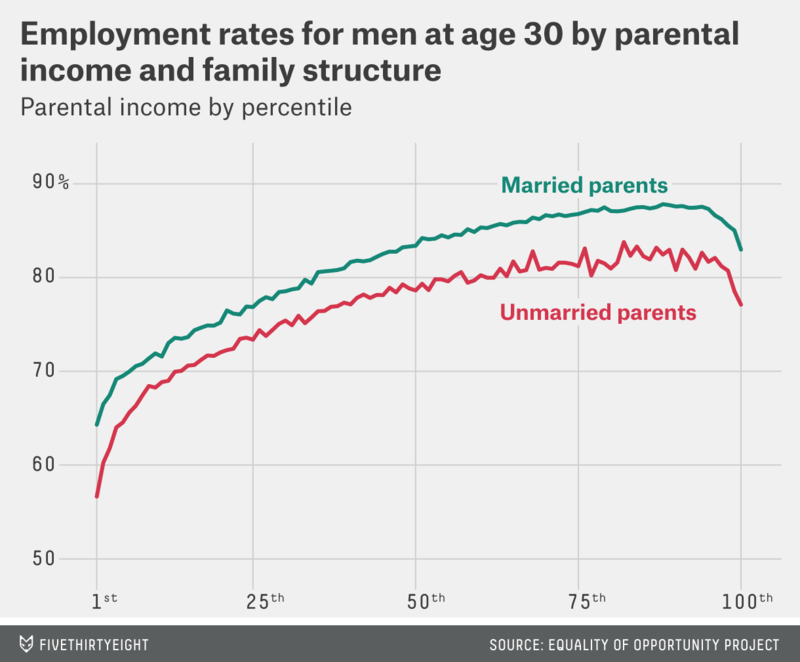 But the correlation is clear: Across the parental income spectrum, boys raised in households with married parents are more likely to work at age 30 than those with unmarried parents. But this is not the case for girls. 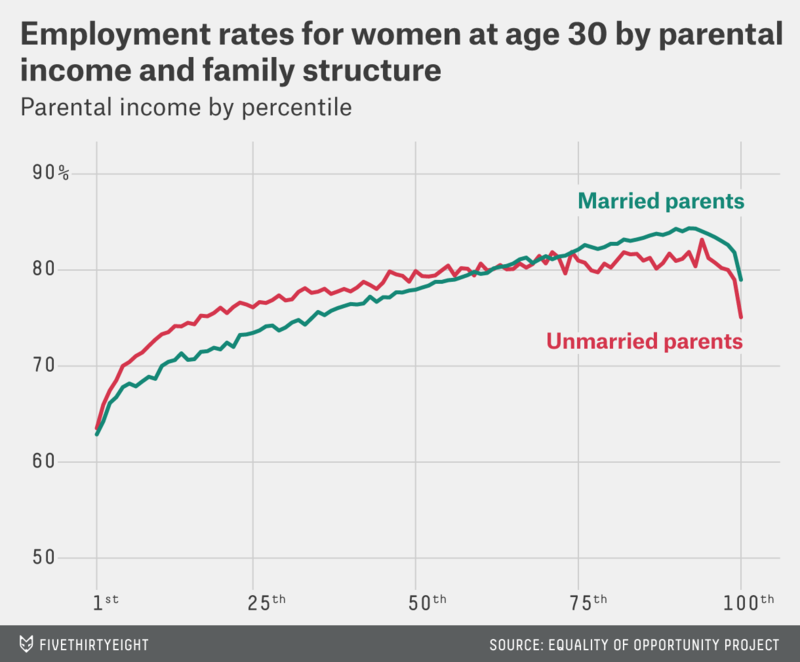 Women from households with unmarried parents in the bottom half of the income distribution are more likely to be working by age 30 than those who grow up in households with married parents, and it’s not until parental income hits the 75th percentile that women are consistently more likely to be working when they come from households with married parents. In previous work, Chetty has found that “intergenerational mobility” — the likelihood that a child will move up into a higher income class than that of his or her parents — varies greatly from city to city and even neighborhood to neighborhood. Poor children from San Jose, California, for example, have a reasonably good chance of reaching the middle class or even becoming affluent; low-income children from Charlotte, North Carolina, are much less likely to climb in that way. For privacy reasons, Chetty and his co-authors can’t release the underlying IRS data they used in their analysis. But they have released detailed tables showing adult outcomes and gender gaps down to the county level. See all their data on their website. Chetty et al. define “work” as having any wage or salary earnings (as reported on a W-2 form). They find similar trends when they use a broader definition that includes non-wage earnings, such as self-employment income. 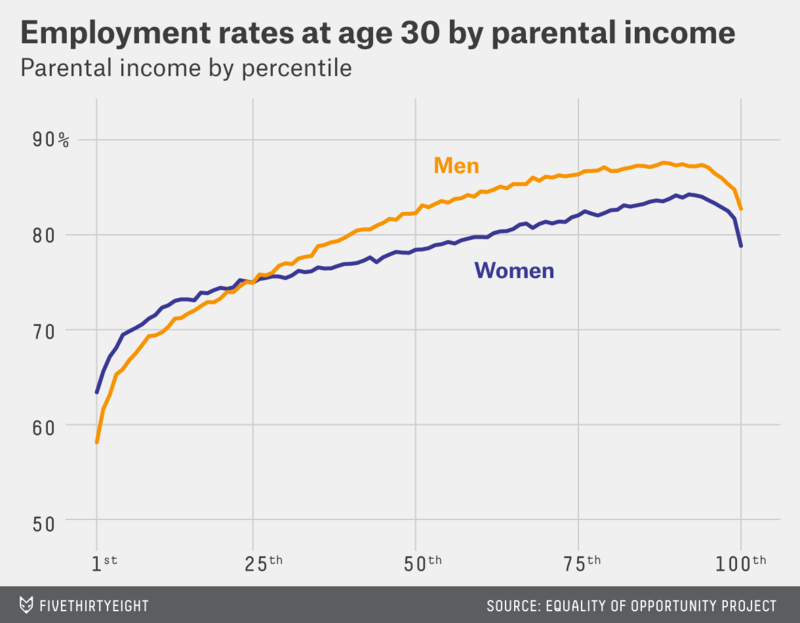 This is based on a simple average of men and women’s employment rates. College attendance was determined by whether the child had filed one or more 1098-T forms when he or she was 18 to 23 years old. Children were classified as being in a household with unmarried parents if their parents were unmarried when the child first appears in the data set as a dependent listed on tax forms.